With PA Server Monitor, you can run reports and see mathematical predictions of when server disk drives will run out of room. Follow the steps below. Install PA Server Monitor and add the computers that you want to monitor. By default, the Disk Space monitor will check and record the free and used disk space once every 6 hours. This is configurable. After a few days, there will be enough data to start creating trend lines in the Free Disk Space report. 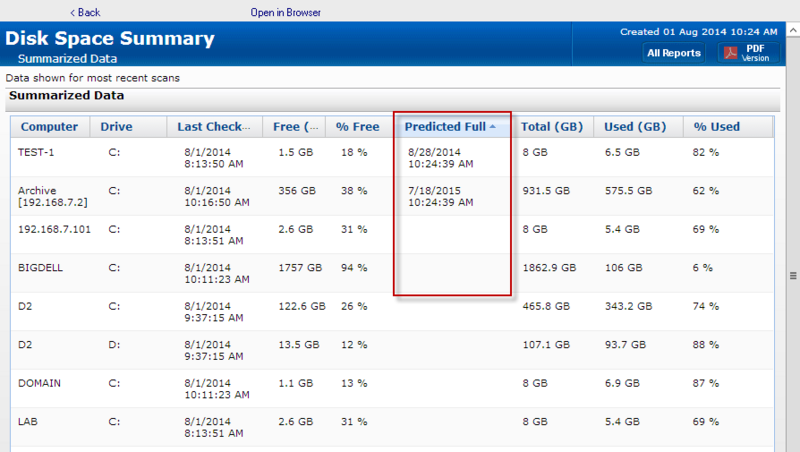 To get a Predicted Full Date, run the Free Disk Space -> Disk Space Summary report. You can easily select all the drives on all the servers that you are monitoring, or any subset. On the Filters and Parameters tab, make sure the 'Predicted Full' column is selected in the 'Columns to Show' parameter. When the report finishes, click the Predicted Full column header to sort by that column. Note that if a drive's disk usage isn't trending up, it won't have a Predicted Full date. This is normal and expected.